If you’re a fan of both fast food and ketchup, you have undoubtedly cursed the poor design of the ketchup packet more than once. When you decide to sit down inside the restaurant you may or may not find little plastic or paper cups to put your ketchup in. But when you eat on the go, you have little choice other than squeezing the ketchup out onto a paper napkin. 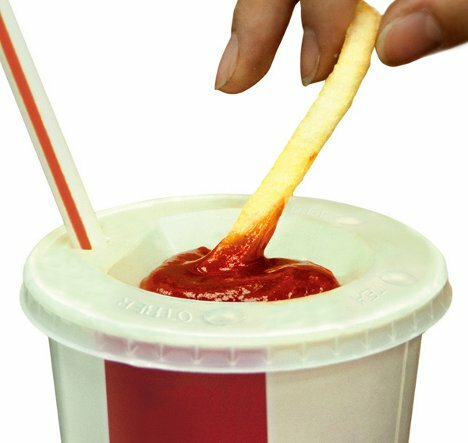 This brilliant invention aims to make the whole process of dipping fries in ketchup a simpler, cleaner one. The Dipping Cover is a concept developed by Bae Su-kyoo and Noh Haeun. It’s a regular soft drink cup lid with the standard hole for a straw, but it also features an indentation for ketchup in the middle. You simply squeeze your ketchup packet right into this little indentation and you can then carry your sauce with you as you walk around. 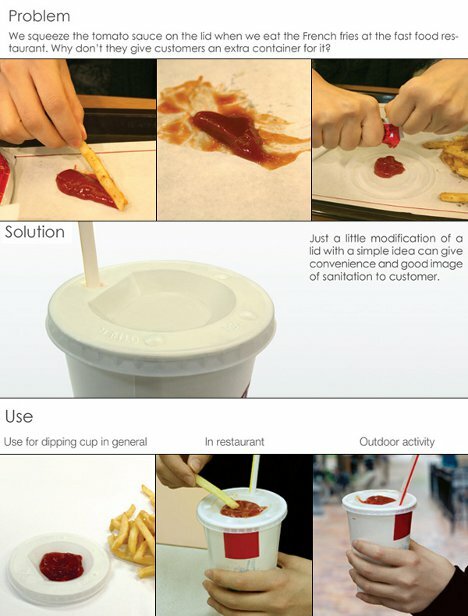 Life changing design it is not, but it sure could make lunch a lot more pleasant for french fry lovers.